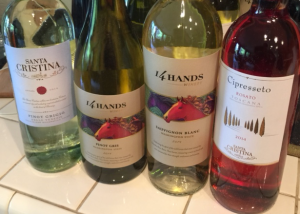 14 Hands Archives - Write for Wine: It's Wine O'Clock Somewhere!Write for Wine: It's Wine O'Clock Somewhere! Our recent sunny May weather makes us think of summer sippers while it is still spring. So here are some recent releases of good-value whites and rosés that pair perfectly with warm evenings on the deck or patio. Samples were provided by 14 Hands and Santa Christina, both of which are part of Ste. Michelle Wine Estates.